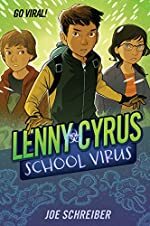 Review: There is a boy named Lenny Cyrus who has a big crush on a girl named Zooey and has a best friend named Harlan. He also has created a virus that infected the whole middle school with his own knowledge. You might be thinking, "How could a boy infect everybody at school?" Well with all the knowledge he has, it would be pretty easy in Lenny Cyrus School Virus by Joe Schreiber. Lenny Cyrus is a kid in middle school with two Nobel Prize winning parents. He also has a photographic memory. But none of that can prepare him for dealing with girls! , So he can remember a lot of things. He has a huge crush on this girl, Zooey Andrews, and has had one since he was 8. And when they first met, it was when she was defending him from a bully. From that point on she liked her, but he never knew if she liked him back and was just too nervous and shy too ask her or even talk too her. Today she is still at her school and is directing her own play that is a musical with horror with Christmas, called Escape Claus. His friend Harlan was his very best friend and only friend, but Harlan has helped Lenny through the rough times he has went through. Since he really likes Zooey Andrews and he was really smart, he decided to make a machine to shrink himself and go inside the her body to go to her brain and make her love him. During the adventure he gets help from some bacteria and other virus to get him to the brain through the blood stream. Also, because of Lenny, she has to miss her own play because of this virus that Lenny has caused because of what he does and it could infect the whole school. You'll just have to find out in Lenny Cyrus School Virus. Now, with Lenny's brilliance, he creates a virus that he hopes will bring him closer to Zooey and convince her to love him. But, can a virus ever really be good? Lenny Cyrus School Virus by Joe Schreiber is a really good book with a lot of interesting points in the book. The book also has a lot of details, which helped imagine the book even though it had very few pictures. Lenny Cyrus also made the book learn in a story about bacteria and other germs in your body. The book also has points where there are a lot of words that most younger people will not understand. But, overall the book is very good.